As a Voluntary Aided Church School, Chapmanslade School’s Governing Board is the Admissions Authority. Our Admissions Policy can be found under the “Policies” tab. The Admissions Policy clearly states the criteria we use to determine admission to this popular school. The villages of Chapmanslade and Corsley make up our immediate catchment area. However, our pupils come from a range of postal addresses including the towns of Westbury and Frome, and many villages in between. We hold Open Days each October and encourage visits to the school. If you feel that Chapmanslade is the right school for your child, you are advised to list the school as your first choice. 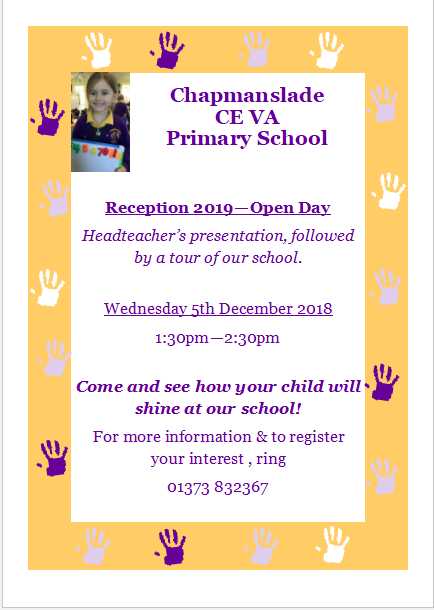 Once you have accepted a place at Chapmanslade School, you will be invited to an introductory evening for new parents in July; our Reception Class teachers will make an initial visit to meet your child in his/her pre-school or nursery setting during June; and new pupils have two visiting mornings in July. There is a short transition period of two to three weeks in September to settle the children in, and for the vast majority of children, full time school begins towards the end of September. We operate a waiting list for pupils who would like to join us. If a place becomes available, the criteria within our Admissions Policy will be used if there is more than one pupil waiting for a place in the same year group. We welcome visits to the school. The Head Teacher will meet with you to discuss the reasons why you wish to change schools, and a visiting day will be arranged so that prospective pupils feel confident about joining us. Changing schools may be disruptive to a child’s education and we strive to ensure that the move is right for you and your child. If you are moving, or have moved, into our catchment area, please contact Mrs McCall as soon as possible to discuss the availability of places. The admissions policy for the school states that pupils will be considered for admission to the school if they attend church monthly for 6 months prior to their application. In order to confirm church attendance, please ask your parish priest or minister to complete and sign this form which must be returned to the school by the date indicated.